In all of those beautiful images of Uranus captured by Hubble and the Voyager, it’s got a blue-green color. How did Uranus get this color? The color of Uranus comes from its atmosphere. Just like Jupiter and Saturn, Uranus is composed mostly of hydrogen and helium, with trace amounts of other elements and molecules. The third most common molecule in the atmosphere of Uranus is methane (CH4). This substance causes the blue-green color of Uranus. Here’s how it works. Although it looks white, the light from the Sun actually contains all the colors in the spectrum, from red and yellow to blue and green. Sunlight hits Uranus and is absorbed by its atmosphere. Some of the light is reflected by the clouds and bounces back into space. 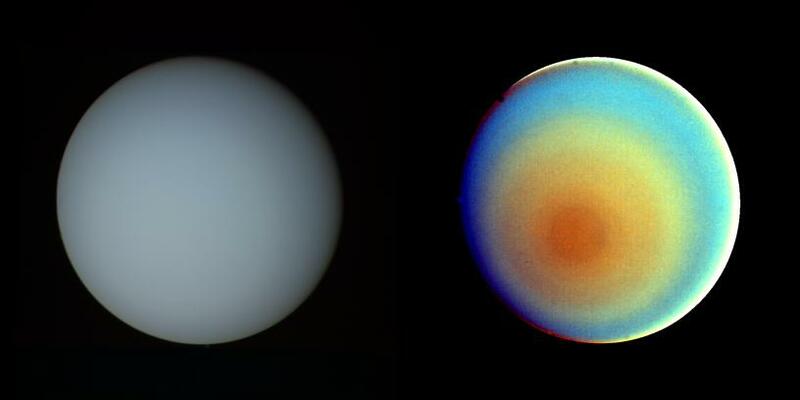 The methane in the clouds of Uranus is more likely to absorb colors at the red end of spectrum, and more likely to reflect back light at the blue-green end of the spectrum. And that’s why Uranus has its blue color. We have written many stories about Uranus on Universe Today. Here’s an article about recent Hubble images of Uranus and Neptune. This photograph from NASA has one of the best true-color images of Uranus. And here’s more information on Uranus from Hubblesite. i was wondering wat the colour is ???????????????????????????????????????????????????????????????????????????????????????????????????????????????????????????????????????????????????????????????????????????????????????????????????????????????? Next PostNext What is Uranus Made Of?